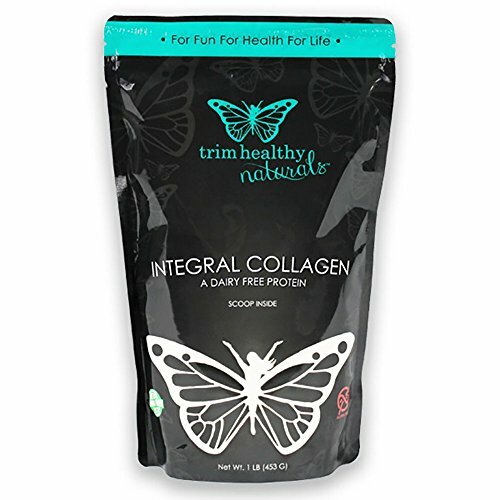 Trim Healthy Mama Integral Collagen Dairy and pork FREE Protein Powder 1 Lb. Contains ZERO: Antibiotics, Hormones, Pesticides, Preservatives and Additives Integral Collagen: Integral Collagen is a pure protein powder for health and beauty as well as yummy food creations. From the grasslands of Argentina and Brazil, bovine Integral Collagen is pork free and processed with integrity. It dissolves easily in liquid with no blending required and is completely tasteless. This makes it the perfect choice to swirl into Greek yogurt or pour into your hot tea for a nutritional overhaul. Integral Collagen is the "let's get serious" approach to adding collagen to your diet. It is simply gelatin broken down into smaller amino acid chains called peptides, accomplished by a nature enzyme found in pineapples. These peptides can be quickly absorbed into the bloodstream and efficiently utilized by the body for improved hair, skin, bone, and joint nourishment and support. As the primary structural protein in the body's connective tissues, collagen plays a vital role in the maintenance of the cartilage, tendons and ligaments that keep joints functioning properly. Protein based foods also take longer than carbohydrates to break down in the body, providing you with a longer-lasting energy source. Are you ever a stressed out Mama, wound up as tight as a tick? Collagen is known for helping to maintain the health of the central nervous system and aids in the functioning of the digestive system. Collagen peptides are abundant in Glycine, an amino acid that has several important roles within the body. It can also support glycogen storage, helping to make more Glucose available for energy production. In our homes we use Integral Collagen every morning in our Trimmaccino coffee to help ready ourselves for the day. If you have any questions about this product by Trim Healthy Mama, contact us by completing and submitting the form below. If you are looking for a specif part number, please include it with your message.